I’ve always been a big fan of snickerdoodles. I mean, isn’t there something just magical about the harmony of cinnamon and rich, buttery cookie goodness? Spoiler alert: it doesn’t stop there. This recipe adds browned butter (cooked butter with a more nutty flavor) and caramel squares. Yes, please! I always, always, get rave reviews on these cookies. They’ve never failed me, and as a busy person still in school, reliability in a recipe is key. And the flavor is just spot-on. They’re like a beautifully perfect hash of cinnamon, toffee, caramel, and cookie. 1. In a medium bowl, Whisk together the flour, baking soda, cream of tartar, cinnamon, and salt. Set aside. 2. To brown the butter, heat a thick-bottomed skillet on medium heat. Add the sliced butter, whisking frequently. Continue to cook the butter until melted. The butter will start to foam and browned specks will begin to form at the bottom of the pan. The butter should have a nutty aroma. Watch the butter carefully because it can go from brown to burnt quickly. Remove butter from the heat and let cool to room temperature. 3. In the bowl of a stand mixer, combine the brown butter and sugars. Mix until blended and smooth. Beat in the egg, yolk, vanilla, and yogurt and mix until combined. Slowly add in the dry ingredients and mix until just combined. 4. Form the dough in a ball and cover with plastic wrap. Chill in the refrigerator for at least 30 minutes. You can chill the dough overnight. 5. When ready to bake, preheat the oven to 350 degrees F. Measure about 2 tablespoons of dough and roll into balls. Flatten the ball with the palm of your hand and place a piece of caramel in the center of the dough. 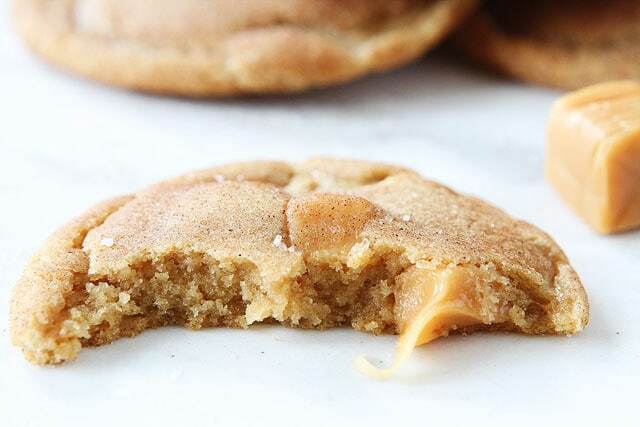 Wrap the cookie dough around the caramel, making sure the caramel is completely covered with dough. 6. In a small bowl, combine the cinnamon and sugar. Roll the balls in the cinnamon-sugar mixture. Place dough balls on a large baking sheet that has been lined with a Silpat baking mat or parchment paper. Make sure the cookies are about 2 inches apart. Sprinkle the cookie tops with sea salt. 7. Bake the cookies 8-10 minutes or until the edges of the cookies begin to turn golden brown. The centers will still be soft. Cool the cookies on the baking sheet for 2-3 minutes, or until set. Transfer cookies to a wire cooling rack and cool completely. Welcome! Here on In for a Cup, In for a Pound, we go all in, head-first into challenging recipes, interesting flavor combos, and anything we can get hold of.